Antique tribal rugs were woven using geometric patterns with a looser weave and generally only in small formats. The patterns had been handed down for countless generations in an oral tradition until the very early 20th century. Tribal rug patterns are elemental in form and considered symbolic. As they generally had no written history, the rugs and their patterns were very important to the tribal people and became their cultural heritage. Tribal weavers knew the patterns by heart and made variations as they wove. They tended to use full color palettes and dramatic tonal juxtapositions. Collectible tribal rugs still in the market today came mostly from the Caucasus Mountains and the tribal groups of Southwest and Central Persia of the 19th century. They were woven both on the nomadic trail as well as in village settings. 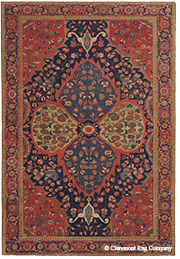 Major styles: Caucasian rugs, Southwest Persian Qashqai, Afshar, Kurdish, Shirvan, Bakhtiari and Arab Khamseh rugs. City carpets were the most elegant of all carpets and were woven in workshops under the careful watch of master rug designers who insured a higher level of quality, for example Hadji Jallili (Haji Jalili) of Tabriz. Using the finest of weaves, these carpets exhibit very precise curvilinear designs with considerable attention to fine detail. The patterns were invariably floral or botanical in nature. The pile was generally cut low to accentuate the great clarity characteristic of city weavings. Called “The Art of Absolute Symmetry”, their perfect, symmetrical drawing is thought to reflect the perfect order of the universe. Each city had its own characteristic set of pattern languages and color palettes. These carpets were often produced from sophisticated knot-by-knot plans, known as “cartoons,” that were created by master carpet designers. The weavers’ responsibility was to follow the cartoon exactly. 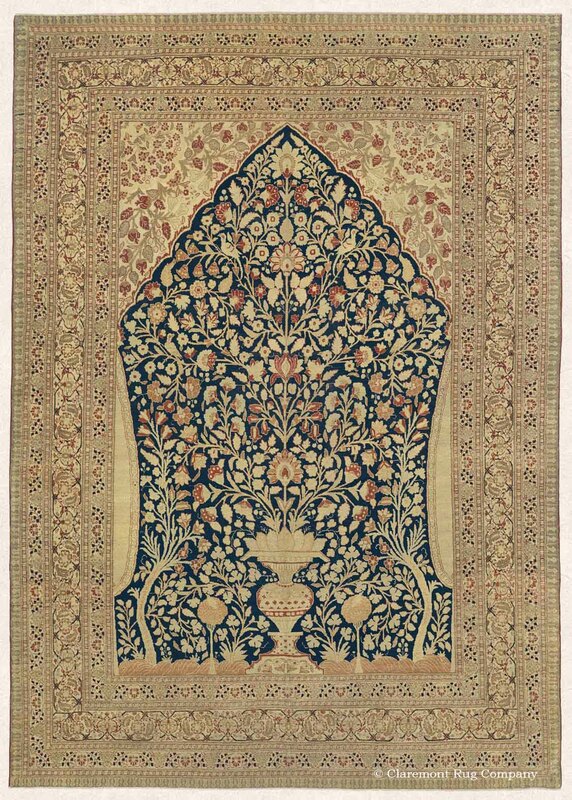 Major styles: Tabriz (notably from the Hadji Jallili (Haji Jalili) workshop), Laver Kirman (notably from Tausenchian, Khasati and Delmaghani), Kashan (notably from Motasham and Dabir workshops), Amritsar, Agra, Meshed, and Tehran. 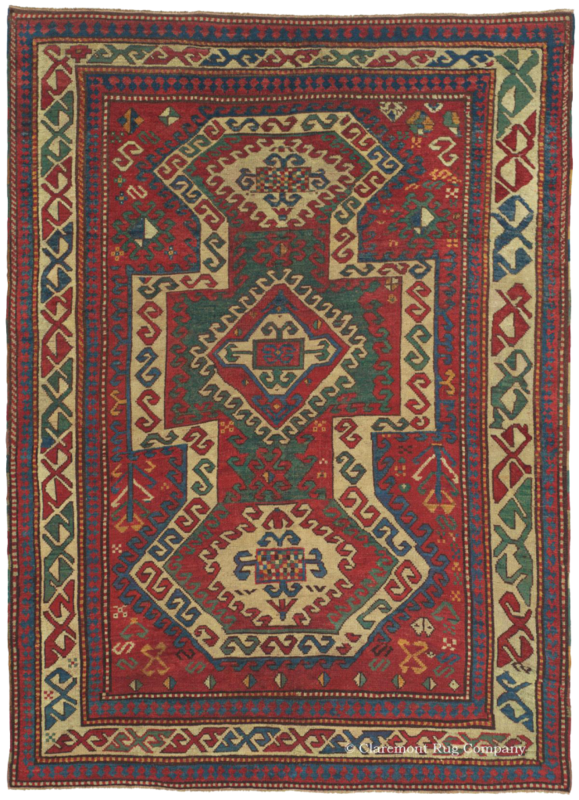 Town rugs, primarily woven in a workshop setting, were the bridge between the more casual nature of the village and tribal rugs and the great formality of the city rugs. Typically, weavers worked from elaborate sketches. 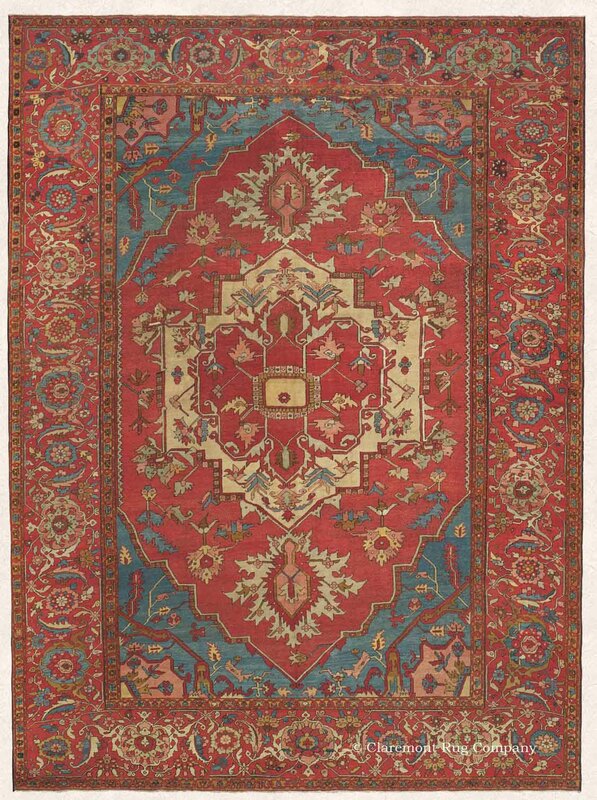 At this level of organization, however, there was room for the weavers to include some of the asymmetry and variability seen in the village carpets as well as more novel color palettes than the more sophisticated city carpets. Their patterns will range from semi-formal, quite stylized drawing as in Ziegler Sultanabads to formal, slightly angular work as seen in the Bijars (Bidjar) and the Ferahan Sarouks, one of the most revered rugs of the 19th century. Major styles: Bijar (Bidjar)(notably Halvai), Ferahan and Ferahan Sarouk, Sultanabad, Senneh, Joshegan and Veramin. The villages surrounding the major weaving cities and towns created rugs that married the casual nature of the tribal rugs and the greater formality of the town rugs. The designs are somewhat planned, often directed by the head weaver. The construction is looser also and village patterns tended to be drawn in a more angular manner than floral and stylized floral imagery woven in more sophisticated settings. The colors in village rugs presented a range of tonal variations, from subtle to dramatic. These cottage-level pieces were often woven in a weaver’s own home allowing her and her extended family to integrate weaving with their daily life responsibilities. Village carpets offer the most casual decorative possibility in room sizes and larger formats. The Bakshaish and Serapi carpets from the Azerbaijan region are the most famous and widely sought after of the village carpets. Major styles: Bakshaish, Serapi, Malayer, Serab, and Heriz.